You will have 1 partner and send them 1 handmade or storebought holiday card (no religious themes - generic holiday greetings only), with a nice holiday message or good wishes, signed by you. 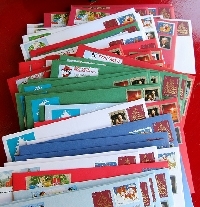 Postcards or letters are not acceptable for this swap, only holiday themed cards, at least 3 1/2 x 5 inches in size. . REMINDER: Please write the swap name on the inside or back of card - there are a lot of holiday card swaps this time of year and it's easy to get confused!